Getting started on managing the energy budget is hard work and requires focus and dedication. So what is the payoff for all of the hark work? To answer this question, SchoolDude.com studied 4 districts in Texas randomly selected. We added to this Killeen ISD because we knew that Darron Cole, the district’s energy manager had been working very hard to improve the district’s energy spending profile. 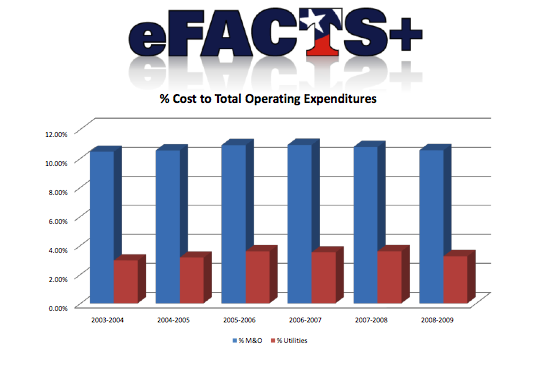 Some good folks at Texas ASBO (TASBO) enabled us with some data from all of those districts from the TASBO eFACTS system. The lessons learned from the tale of these 5 districts were striking. We learned that the energy spending in Texas school districts rose from around $800M in 2003-2004 to over $1.3B in 2007-2008, a rise of 63%. 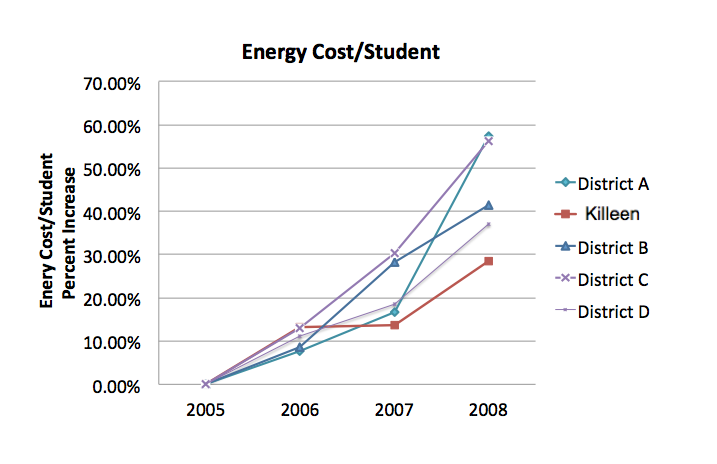 Adjusting for student enrollment growth, the energy cost per student rose from around $200 to approximately $275 over that same time period or 38% growth – similar to the US trends. While the amount of the total school district budget allocated to M&O was held about the same (10%), the energy budget rose rapidly within it creating compression on maintenance payroll, equipment and supplies, cleaning, and the general school budgets. The five districts we studied, started at the exact same point in budget year 2005. That was where they were at that point. Their “stats” on cost per student or use per square foot might have been different but they all started where there were at that point in time. But, they all ended at a very different point. While many (most?) school districts did nothing, Darron Cole and Killeen ISD worked hard at it. Their results speak for themselves. Using software (UtilityDirect) to track and manage his progress including weather correlation and school by school comparison reports.